Cardiotrophin 1 (CT-1) is a recently described cytokine originally isolated from the heart where it has been shown to play an important role in apoptotic protection of cardiomyocytes and heart hypertrophy. Its beneficial properties have also been described in other organs such as liver and neuromuscular tissue. In the present study, we investigated whether CT-1 can confer protection against pro-apoptotic stimuli in pancreatic beta cells, and its role in insulin secretion and diabetes development. The effects of CT-1 on apoptosis and function were studied using MIN6B1 cells and freshly isolated murine pancreatic islets. The impact on the development of diabetes was evaluated in Ct1-null (Ct1 −/−) mice (the gene Ct1 is also known as Ctf1) using two streptozotocin (STZ)-induced models of diabetes. CT-1 has a protective effect in MIN6B1 cells and murine islets under the pro-apoptotic stimulus of serum deprivation, which correlates with the expression of B cell lymphoma-extra large, or following exposure to a mixture of cytokines. In addition, CT-1 enhances glucose-stimulated insulin secretion in MIN6B1 cells and this was repressed by inhibitors of phospholipase C. Furthermore, Ct1 −/− mice were more prone to develop diabetes, and their glucose tolerance test showed impaired plasma glucose clearance which correlated with decreased pancreatic insulin secretion. The results obtained from both in vitro and in vivo experiments show that CT-1 improves beta cell function and survival, and protects mice against STZ-induced diabetes. The online version of this article (doi: 10.1007/s00125-012-2822-8) contains peer-reviewed but unedited supplementary material, which is available to authorised users. An erratum to this article can be found at http://dx.doi.org/10.1007/s00125-013-2865-5. Diabetes is a chronic disease, defined and diagnosed by chronic hyperglycaemia that requires a lifelong therapeutic self-care regimen to maintain normal blood glucose levels . Despite improvements in therapy, the life expectancy of diabetic patients is still below that of the general population, and they experience an extraordinarily high incidence of heart attacks, stroke, kidney failure, blindness and other complications . An absolute or relative decrease in beta cell mass and function underlies type 1 and type 2 diabetes, respectively, rooted in diverse mechanisms. Inter-organ communication may play an important role in the pathophysiology of diabetes, possibly contributing to decreased beta cell functional mass, especially in type 2 diabetes. For example, adipokines including leptin  and as yet to be identified myokines  can influence beta cell function, survival and proliferation. Cardiotrophin-1 (CT-1) is a member of the IL-6 family of cytokines that was originally isolated from cardiac tissue and identified by its ability to induce hypertrophy in cardiomyocytes . Its receptor consists of a heterodimer made of glycoprotein 130 (GP130) receptor and leukaemia inhibitory factor receptor (LIFR), together with a yet to be described third component . It is also known that CT-1 has beneficial effects in several tissues, such as motoneurons, by protecting them from apoptosis or by participating in regeneration mechanisms . Recent studies have reported the protective role of CT-1 in the liver; CT-1 is upregulated during liver regeneration and exerts anti-apoptotic effects on hepatocytes . Consistent with these findings, the overexpression of CT-1 in the liver efficiently protects rats from fulminant hepatic failure after subtotal hepatectomy . Furthermore, the CT-1-related cytokine IL-6 has been shown to act as a protective agent against apoptosis induced by pro-inflammatory cytokines in murine islets  while also impacting beta cell function indirectly through induction of glucagon-like peptide-1 (GLP-1) secretion from neighbouring alpha cells . In this context, Il6-null mice showed altered carbohydrate and lipid metabolism as well as impairment in glucose homeostasis . Interestingly, the liver and the pancreas are closely related organs with a common embryonic origin . Both organs share important metabolic pathways, transcription factors and transmembrane receptors . Based on these premises, the main goal of this study was to analyse whether the protective effect of CT-1 observed in liver tissue could be extended to pancreatic beta cells. Also, we investigated the role of CT-1 in glucose metabolism and the development of streptozotocin (STZ)-induced diabetes in Ct1-null (Ct1 −/−) mice (the gene Ct1 is also known as Ctf1). MIN6B1 cells  were maintained in Dulbecco’s modified Eagle medium (Gibco, Paisley, UK) containing 15% fetal calf serum (FCS), 71 μmol/l β-mercaptoethanol, 2 mmol/l glutamine, 100 U/ml penicillin, 100 mg/l streptomycin and 110 mg/ml sodium pyruvate (Sigma-Aldrich, St Louis, MO, USA) on adherent 175 cm2 flasks. C57Bl/6J wild-type (WT) and C57Bl/6J Ct1 knockout mice (Ct1 −/−) were bred and housed in pathogen-free animal facilities at the University of Navarra. Ct1 −/− mice were originally generated by Oppenheim et al . All the mice had free access to water and food. Animal procedures were performed in accordance with approved protocols and following the criteria outlined in the Guide of the Care and Use of Laboratory Animals by the National Academy of Sciences. Murine islets were isolated from 6- to 9-week-old male C57/BL6J mice using collagenase digestion, followed by Ficoll gradient purification, and manually harvested as described by Li et al . The purified islets were collected using a glass pipette under a stereo microscope (Olympus SZ51, Bilbao, Spain) and maintained in Petri dishes. The isolated murine islets were seeded on 48- or 96-well plates pre-coated with poly l-lysine (Sigma-Aldrich). In order to obtain dispersed cells, the islets were digested by trypsin/EDTA (Biowhitaker, Verviers, Belgium) treatment (37°C, 3 min) followed by gentle dispersion with a pipette. Total RNA was isolated from 5 × 106 P19 and MIN6B1 cells and 200 freshly isolated pancreatic islets. cDNA was synthesised from 1 μg total RNA using the First Strand cDNA Synthesis Kit (Invitrogen, Carlsbad, CA, USA) following the manufacturer’s instructions. Glyceraldehyde 3-phosphate dehydrogenase (Gapdh), Lifr, Gp130 and Ct1 expression were evaluated using a real-time PCR quantitative system (Applied Biosystems, Foster City, CA, USA) with the oligonucleotides presented in electronic supplementary material (ESM) Table 1. The relative amount of mRNA was normalised according to the levels of Gapdh as housekeeping gene and using the mouse embryonal carcinoma cell line P19 and total RNA (BD Biosciences, Palo Alto, CA, USA) as positive controls. MIN6B1 cell line and murine islets were subjected to serum deprivation to stimulate apoptosis by incubating the cells with their corresponding medium without FCS for 48, 96 and 120 h. In addition, murine islets were treated for 24 h with a cocktail of pro-inflammatory cytokines (50 U/ml IL-1β; 1,000 U/ml TNF-α; 1,000 U/ml IFN-γ) (Cytomix; eBioscience, Frankfurt, Germany) to induce apoptosis. CT-1 (DRO Biosystems, San Sebastian, Spain) or IL-6 (AbD Serotec, Oxford, UK) was added to the media at 100 ng/ml. Apoptotic levels were determined by the luminescence assay kit Caspase-Glo 3/7 assay (Promega, Madrid, Spain), which measures caspase-3 and -7 activities in the cell lysates. For the MIN6B1 assays, the rate of cell death was analysed using TUNEL staining (Roche, Mannheim, Germany), which detects nuclei in cells undergoing apoptosis or necrosis by immunofluorescence. It has been shown previously that under these conditions of culture, cell death detected by TUNEL is due predominantly to apoptosis . The percentage of apoptotic cells was quantified using ImageJ-based software (NIH, Bethesda, MD, USA), where a brightness threshold detection system quantifies apoptotic cells (TUNEL-positive cells) in relation to the total number of cells (stained with 4′,6-diamidino-2-phenylindole [DAPI]; Vector Labs, Peterborough, UK). Protein was extracted from 1–2 × 106 MIN6B1 cells and/or 200–300 murine islets after treatment with lysis buffer (150 μl, 15 min). Samples were spun at 21,000 g (20 min, 4°C) and the pellets were discarded. Protein concentrations of the supernatant fractions were assessed with a BCA kit (Pierce; Rockford, IL, USA). Fifteen micrograms of protein were resuspended in loading buffer, separated in a 12% polyacrylamide gel, and transferred onto a nitrocellulose membrane. Immunoprobing was performed by incubating the membranes with primary antibody (signal transducer and activator of transcription 3 [STAT3], pSTAT3, extracellular signal-regulated kinase [ERK] and pERK; Cell Signaling, Beverly, MA, USA), B cell lymphoma-extra large (BCL-xL; BD Biosciences) and GLUT2 (Millipore, Darmstadt, Germany) overnight at 4°C. Anti-rabbit IgG coupled to alkaline phosphatase was used as a secondary antibody (1 h, room temperature). Membranes were revealed to detect the presence of alkaline phosphatase activity using a Tropix revealing kit (Applied Biosystems). Relative quantities of STAT3, pSTAT3, ERK, pERK, BCL-xL and GLUT2 were determined using densitometer software (Bio-Rad, Madrid, Spain). β-Actin or β-tubulin (both purchased from Sigma-Aldrich) were used to normalise the samples in the same membrane. Flow cytometry was used to measure the ability of fresh isolated WT and Ct1 −/− islets to take up the non-metabolisable glucose analogue 6-(N-(7-Nitrobenz-2-oxa-1,3-diazol-4-yl)amino)-6-Deoxyglucose (6-NBDG; Invitrogen) (200 μmol/l, 37°C, 10 min). MIN6B1 cells were seeded at 50,000 cells/cm2 on 24-well plates and incubated under standard conditions for 48 h. Subsequently, cells were preincubated for 2 h in Hanks’ balanced salt solution (HBSS) supplemented with 1% bovine serum albumin (BSA) and 2.8 mmol/l glucose at 37°C. After washing, cells were incubated for 1 h with the same solution to determine the basal levels of insulin secretion. Subsequently, they were incubated for 1 h with HBSS supplemented with 1% BSA and 16.7 mmol/l glucose in combination or not (controls) with CT-1 (100 ng/ml) and the phospholipase C (PLC) inhibitors: neomycin (10 μmol/l; Sigma-Aldrich) and U73122 (2 μmol/l; Sigma-Aldrich) or its structural inactive analogue U73343 (2 μmol/l; Sigma-Aldrich). Finally, the cells were treated with a mixture of ethanol/acetic acid (95:5) to release the intracellular content of insulin. The supernatant fractions were collected and stored at −20°C. Insulin was detected using a commercial ELISA kit (Mercodia, Uppsala, Sweden). Diabetes was induced by intraperitoneal administration of STZ (Sigma-Aldrich) to 10- to 12-week-old C57Bl/6J WT and C57Bl/6J Ct1 −/− male mice according to two models: an ‘acute model’, performed by the injection of a single dose of STZ (150 mg/kg), and a ‘chronic model’, based on the administration of multiple low doses of STZ  in which mice were treated with STZ at 50 mg kg−1 day−1 for four consecutive days. Once mice were treated with STZ, blood samples were collected daily (09:00–11:00 hours) from the tail vein of non-fasted mice and glucose was measured with a blood glucose meter (Accu-Chek Aviva; Roche). Mice were considered diabetic when non-fasting blood glucose levels were >16.7 mmol/l for at least three consecutive days. C57Bl/6J WT and C57Bl/6J Ct1 −/− male mice were fasted overnight (16–18 h), weighed and injected with d-glucose (Sigma-Aldrich) at a dose of 2 g/kg body weight intraperitoneally. Blood samples (50 μl) were obtained from the tail vein before and at 5, 10, 15, 20, 25, 30, 45, 60 and 120 min after glucose administration. Blood glucose levels were determined using a glucose meter (Accu-Chek Aviva). Once the animals were killed, pancreases were isolated and fixed in 10% formalin (6 h at room temperature). Tissue samples were embedded in paraffin, cut in 5 μm sections, deparaffinised, and analysed by immunohistochemistry. Immunolabelling was performed with a primary antibody specific to insulin (dilution 1:100; Dako, Glostrup, Denmark). Signal amplification was performed using either the Envision system (Dako) or chromogen diaminobenzidine (Dako). All sections were viewed under a Nikon Eclipse E600 microscope (L'Hospitalet de Llobregat, Barcelona, Spain). For the determination of total pancreatic insulin content, pancreases obtained from normal mice and STZ mouse models of diabetes (WT and Ct1 −/−, acute and chronic models) were homogenised and insulin was extracted with a mixture of ethanol/acetic acid (95:5). The insulin present in the supernatant fractions was detected using a commercial ELISA kit (Mercodia) and was measured in reference to the weight of the total pancreas. All data were expressed as mean ± SD. The Gaussian distribution was confirmed using the Kolmogorov–Smirnov test. In experiments where data differences between two groups were assessed, statistical significance was analysed using Student’s unpaired t test. For non-parametric data, the Kruskal–Wallis test and Mann–Whitney U test were used. All statistical analyses were performed using the GraphPad Instat software version 3.00 for Windows (GraphPad Software, San Diego, CA, USA). All p values <0.05 were considered statistically significant. To explore the role of CT-1 in beta cell function, we first analysed the expression of Ct1 and the two known components of its receptor, Gp130 and Lifr, in both freshly isolated murine islets and MIN6B1 cells. Using real-time quantitative PCR, we detected similar mRNA expression levels in both cell sources (Table 1). Previous studies performed in cardiomyocytes and hepatocytes have reported that CT-1 activates important signalling pathways, such as Janus kinase (JAK)/STAT3, ERK1/2 and AKT [19, 20, 21]. To investigate whether CT-1 activates these pathways in beta cells, fresh isolated murine islets were stimulated in vitro with CT-1 (100 ng/ml) for 15, 30 and 60 min. Our results show that CT-1 treatment significantly induces transient phosphorylation of STAT3 and ERK1/2, peaking at 30 and 15 min, respectively (Fig. 1a, b). IL-6 has been shown to play an important role in the protection of neuroendocrine tumoral PC12 cells subjected to serum deprivation . Also, IL-6 exerts an anti-apoptotic effect on MIN6 cells and pancreatic islets treated with pro-inflammatory cytokines [9, 23], while CT-1, a member of the IL-6 family of cytokines, has proven to be a survival factor for hepatocytes subjected to serum deprivation . To analyse whether CT-1 also displayed cytoprotective effects on pancreatic beta cells, MIN6B1 cells were cultured for up to 120 h under serum deprivation conditions in the presence or absence of CT-1 (100 ng/ml). After 120 h of serum deprivation, there was a significant reduction (38%) in the number of TUNEL-positive apoptotic cells in MIN6B1 cells treated with CT-1 (Fig. 2a). There was furthermore a significant decrease in apoptosis (active caspase-3 and -7) in the presence of CT-1 at both 96 (24.8%) and 120 h (41.7%) of serum deprivation (Fig. 2b, c). We also observed a protective effect for IL-6 (100 ng/ml) at 120 h (Fig. 2c). Similar results were observed when islets obtained from mouse pancreas were subjected to Cytomix (eBioscience) containing pro-inflammatory cytokines IL-1β, TNF-α and IFN-γ (ESM Fig. 1). Since BCL-xL has been demonstrated to be involved in IL-6-mediated suppression of apoptosis in murine islets , we analysed the levels of BCL-xL in MIN6B1 cells treated with CT-1 (100 ng/ml) by western blot. CT-1 treatment of freshly isolated islets subjected to 40 h of serum deprivation significantly increased BCL-xL content (Fig. 2d). We also compared the levels of BCL-xL between MIN6B1 cells treated with CT-1 or IL-6. Our results show that CT-1 and IL-6 were able significantly to increase the levels of BCL-xL to a similar extent after 48 h and 96 h of serum deprivation (Fig. 2e). Recent studies have shown that co-family member IL-6 can induce insulin secretion in MIN6 cells [24, 25]. We now show that in the presence of high glucose, CT-1 treatment likewise stimulates insulin secretion from MIN6B1 cells (Fig. 3b). This effect was observed independently of the CT-1 concentration used (from 100 to 400 ng/ml) (data not shown). The activation of PLC has been implicated in the mechanism of calcium release and activation of other secondary effectors that mediate insulin secretion . In addition, it has been demonstrated that IL-6 activates the PLC pathway in different cell types , including beta cells . Concordant with these results, Suzuki et al  showed that different PLC inhibitors were able to block insulin secretion mediated by IL-6. Therefore, we tested the effect of treating MIN6B1 cells with the PLC inhibitor neomycin (10 μmol/l) (Fig. 3c) or U73122 (and its inactive structural analogue U73343) (ESM Fig. 2) in the presence or absence of CT-1 (100 ng/ml) and glucose (16.7 mmol/l). Our results demonstrate that both neomycin and U73122 were able to block significantly the insulin secretion stimulated by CT-1 observed in combination with high glucose (16.7 mmol/l) treatment (Fig. 3c and ESM Fig. 2), suggesting that the underlying mechanism involves the activation of the PLC pathway. 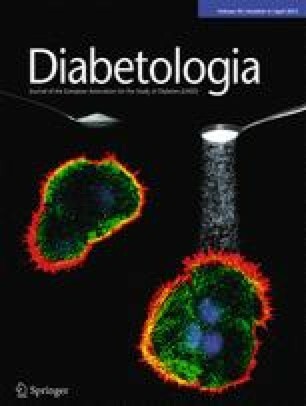 To determine whether CT-1 might be a critical endogenous factor in the protection of pancreatic beta cells against pro-apoptotic stimuli in vivo, we determined the sensitivity of Ct1 −/− and WT mice to the induction of diabetes by STZ based on two models of diabetes (acute and chronic). First, we evaluated the levels of the receptor (GLUT2) through which STZ is taken up by beta cells. Islets obtained from WT or Ct1 −/− mice showed similar levels of GLUT2 (ESM Fig. 3a). By flow cytometry, we also show that both WT and Ct1 −/− islets were equally able to take up the fluorescent glucose analogue 6-NBDG (ESM Fig. 3b). Regarding the two diabetic models used, the acute model consisted of a single high dose of STZ (150 mg/kg body weight) administered intraperitoneally, which induced hyperglycaemia within the first 3 days, with 30% of the mice displaying glycaemia >16.7 mmol/l by the end of the experimental period (Fig. 4a). The second model based on multiple low-dose injections of STZ (50 mg kg−1 day−1 for 4 days) resulted in a more gradual acquisition of hyperglycaemia, with 44% of the mice displaying glycaemia >16.7 mmol/l by the end of the experimental period (Fig. 4c). Ct1 −/− mice were more susceptible to both acute and chronic induction of diabetes, with 90% and 91%, respectively, of the mice becoming diabetic by the end of the study (Fig. 4b, d). After monitoring the blood glucose levels for 1 month, the results showed a progressive acquisition of hyperglycaemia in the chronic model (Fig. 4c) compared with the acute model (Fig. 4a), with higher mean levels of glycaemia in Ct1 −/− mice from 15 and 10 days, respectively, following STZ administration. In addition, during the course of the induction of diabetes in the two models, Ct1 −/− mice showed a slightly higher body weight in comparison with WT mice (data not shown). In order to evaluate the effect of CT-1 on beta cell mass in non-diabetic and diabetic conditions, we determined the total insulin content per pancreas in WT and Ct1 −/− mice. In non-diabetic conditions, there was no significant difference in total insulin content between WT and Ct1 −/− mice (Fig. 5a, b). After treatment with STZ, insulin content was lower in both WT and Ct1 −/− mice subjected to either acute (Fig. 5c, d) or chronic diabetes (Fig. 5e, f) compared with untreated mice (Fig. 5a, b). Regardless of whether acute or chronic diabetes was induced, Ct1 −/− mice presented a more important reduction in total insulin content (Fig. 5d, f; white bars) compared with WT mice (black bars). These results suggest that Ct1 −/− mice are more prone to develop diabetes induced by STZ as a consequence of decreased beta cell mass. Finally, we investigated the impact of Ct1 knockout on glucose tolerance. While fasting glycaemia was unchanged, Ct1 −/− mice presented mild glucose intolerance, with slightly higher glucose levels from 20 to 40 min following glucose injection compared with WT mice (Fig. 6a), accompanied by decreased insulin secretion (Fig. 6b). The cytoprotective effect of CT-1 previously described in various cell types, such as cardiomyocytes and motoneurons [15, 21], has been extended to cultured hepatocytes according to in vivo models of acute severe liver damage [7, 8], suggesting that similar beneficial effects may also apply to other tissues. The present study shows that CT-1 is indeed able to protect pancreatic beta cells from apoptosis induced by serum deprivation and inflammatory cytokines; furthermore, it had a stimulatory effect on insulin secretion in the presence of glucose, which could be prevented via PLC inhibition. Consistent with these in vitro effects of CT-1 on beta cell survival and function, in vivo studies also demonstrate the role of CT-1 in normal glucose tolerance and in preventing the development of diabetes induced by STZ. MIN6B1 is a subclone derived from the murine insulinoma cell line MIN6 with features, mainly in terms of adhesion and insulin secretion, that resemble those of primary beta cells [16, 27]. We show that both MIN6B1 and murine islets express Ct1 mRNA along with the components of its receptor, Gp130 and Lifr. All members of the IL-6 family, including CT-1, play important roles in diverse cellular processes such as proliferation, survival, adhesion and insulin secretion, through a common signalling pathway that involves the GP130 receptor protein . Here, we show that CT-1 induces the activation of mitogen-activated protein kinase and JAK/STAT3 pathways through ERK1/2 and STAT3 phosphorylation, respectively. Moreover, CT-1 treatment promotes the protection of MIN6B1 cells from apoptotic stimuli such as serum deprivation through the upregulation of pro-survival protein BCL-xL, as has been shown for co-family member IL-6 in various cell types, including murine islets . It is important to note that IL-6 has also been shown to improve beta cell function in mice mainly through an indirect route involving the induction of GLP-1 secretion from neighbouring alpha cells . It will be interesting in future studies to investigate whether CT-1 also impacts alpha cell function. The hallmark of beta cells is their capacity for glucose-stimulated insulin secretion. Our results suggest that CT-1 potentiates glucose-stimulated insulin secretion, indicating a possible synergistic effect between CT-1 and glucose which could be likened to the action of an incretin , albeit through different signalling pathways. Neomycin and U-73122 PLC inhibitors prevent this effect in agreement with the role of PLC activation in Ca2+ release from the endoplasmic reticulum and further in the release of insulin granules . CT-1 appears to protect mice from STZ-induced diabetes in vivo, as Ct1 −/− mice show higher susceptibility to develop diabetes and greater loss in insulin content upon STZ-induced damage compared with WT mice based on both acute  and chronic  diabetic mouse models. Ct1 −/− mice also present mild glucose intolerance compared with WT mice, accompanied by reduced insulin secretion in response to the glucose load (measured 10 min after injection), although glycaemia was also normalised at later time points in Ct1 −/− mice. This suggests that impaired beta cell function may underlie the glucose intolerance of Ct1 −/− mice. However, there was a significant increase in the body weight of the Ct1 −/− mice (data not shown) that may also contribute to glucose intolerance, and it will be interesting in future studies to investigate insulin sensitivity in these animal models. Regardless, these data indicate an important role for CT-1 in glucose homeostasis. Different authors have described the role of cytokines such as IL-6, ciliary neurotrophic factor and TNF-α in adipose tissue metabolism , with elevated levels in the blood associated with obesity . CT-1 levels in plasma  and adipose tissue  have recently been correlated with the pathology of the metabolic syndrome, suggesting that CT-1 may be involved in a protective mechanism against the metabolic changes that occur during the initial stages of the disease . Moreover, the presence of CT1 polymorphisms have also been associated with the development of hypertension  and cardiomyopathies . Thus, a similar analysis of the CT1 polymorphisms may provide a genetic link between CT-1 protection and the risk of developing diabetes. In summary, our data here show a novel role for CT-1 in beta cell function and survival both in vitro and in vivo. CT-1 could be a candidate to promote islet survival and function during islet transplantation and may also prove useful in the treatment of diabetes or to slow its progression. This work was supported by the Fundación Mutua Madrileña and Caja de Ahorros de Navarra, and grant number 31003A_127276 from the Swiss National Science Fund to PAH. All authors contributed to the concept and design of the study or to the acquisition and interpretation of data, and to drafting the article or revising it critically. All authors gave approval of the final version to be published.